Starting your own IT Agency? Or Creating a website for IT Agency? You are in the right place. A website is the first most important thing for an IT Agency. To get a professional website, you can assign this work to your team, you can hire a freelancer or you can outsource it to another agency which doesn’t sound good. Being an IT Agency itself, it doesn’t make sense to outsource work to someone else. So, here we have got you covered with this solution. WordPress is the largest used website creation platform. Thanks to such a wide and impressive range of themes which WordPress offers. 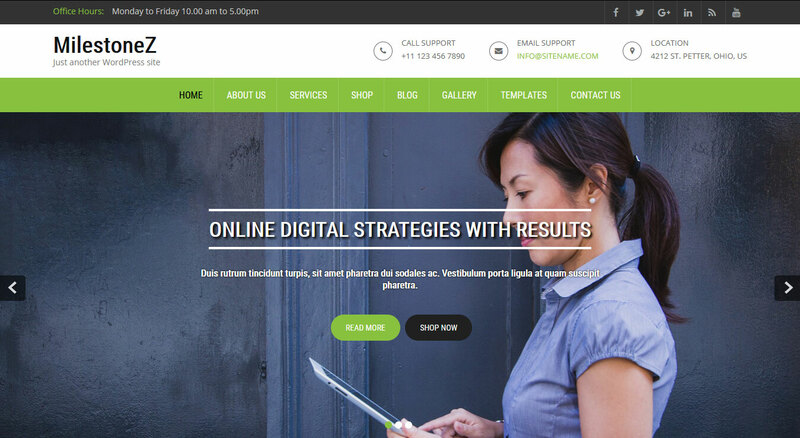 In this post, we will be telling you about 5 Best WordPress themes for the IT Agency website. Believe me, these themes are more than enough for creating a perfect and professional website for an IT Agency. Creating your website using WordPress and the themes which we are mentioning here will save you a lot of money. Generally, a freelancer may charge you $800+. Using a WordPress theme which will cost you around $69 will give you complete control of your website with no insolvency of any other person, you will be saving a lot of money too which you can spend in marketing efforts. Bonus Tip: At the end of this article, we are going to tell you how you gonna get advantage from Grace Themes for your entire IT agency business with just a premium membership from Grace Themes. Which costs $69 only. 6 out of 7 people have rated 5-star rating for ZeroError theme. It comes with Demo options as well as premium support for the life without any other charge. In website speed test, ZeroError took only 3 Seconds in loading and this loading time can be reduced by using CDN with a WordPress optimized server. BizWeb is rated 4.6 out of 5 stars on an average rating by 12 users. While testing page loading performance of BizWeb, it took 3.6 seconds in loading which can be optimized with a CDN and dedicated WordPress hosting server. This is one of the most loved themes from Grace Themes. BigGrowth has been rated 4.7 stars out of 5-stars rating. During Loading speed test of this theme, it took 3.5 seconds in loading which is considered excellent from SEO point of view. Organizing Pro has been rated 5 out of 5-stars by users. During our loading speed test, Organizing Pro took only 2.7 Seconds which is excellent from SEO point of view. It has been rated 4.8 stars out of 5-stars rating from 26 users. During our website loading speed test, MilestoneZ Pro took 3.4 Seconds in loading and this is considered to be a very good speed mark. Again, this loading time can be further improved by using a CDN and dedicated wordpress hosting. Now, the most interesting thing about these themes and how you gonna save money with it. A freelancer may charge you $800+ for your website but you can have all these themes at $69 only and can create a website in minutes. Easy to manage theme options makes it easy for you. Also, you are getting an easy page builder solution in these themes. Bonus Tip: Being an IT Agency, you must be having clients from multiple fields. You don’t have to put a lot of efforts, you can create websites for your clients just the way you created your website. Yes, just install the demo content, put content and website will be ready in minutes. So, no heavy salaries to be paid to developers and you gonna save more time. Fewer expenses, More revenue. Grace Themes offers a bundle of premium themes for almost every purpose and usage. Also, you will be having expert support for a lifetime without any extra cost. So, why delay your website work, get started with Grace Themes now. Shashank is Blogger at Thedigiblog.com covering all the aspects of Internet marketing and Money making ideas in order to grow together with helping people.